This project was not a large scale research project but provides an insight into how tablets are being used in school and the direction of travel that pedagogies take within the first year of tablet implementation. Check out the summary of the findings and the full study. 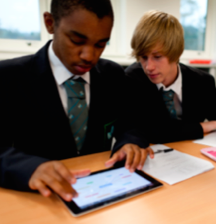 In the first two terms of implementing an iPad programme, Longfield Academy in Kent have noticed a great impact on teaching and learning. The research was carried out on behalf of Naace and supported by 9ine consulting. This report attempts to quantify some of the findings in the previous reports. The Stage 3 objectives were to examine teacher, student and parent engagement, and impact on pedagogy. The research also measured teacher, student, and parent perception of benefits and drawbacks, in addition to reviewing the process of introducing tablets, and summarising the global picture of the use of educational tablets. In spring 2013, Family Kids and Youth identified a total of 24 secondary schools across the UK that had introduced or were in the process of introducing one-to-one Tablets. These included the schools from Stage 1 and Stage 2 of the research. Twenty-one of these schools responded to a comprehensive online questionnaire. Twenty schools allowed our team of researchers to visit them and during these visits interviews were carried out with Leadership and ethnographic observation was carried out in classes that were using one-to-one Tablets. From these interviews and observations, and the completed questionnaires, as well as on-going dialogue with the schools, nineteen individual case studies have been compiled. An increasing number of publications have debated the effects these devices have on teachers and pupils. The following report, carried out by independent researchers Family, Kids & Youth, updates the findings from previous publications and discusses the findings from recent studies, as well as the limitations of the research to date. It also discusses how tablets in particular contribute to learning benefits as well as the issues surrounding tablet use in different educational contexts ranging from nurseries to universities.